"Feel fantastic," he said. "It's so nice to finally get over the line especially after losing heads-up twice. Especially in a field like this, it's pretty prestigious." "For the higher stuff you have to engage your brain," he said. "You don't want to give these guys any more of an edge than they already have. I had to keep a clear mind for sure." "Poker players always think they're the best player in the field, but to be honest I would say I'm in the top third, because it's quite tough," he said. "A lot of it was just good fortune." "He was in the tank for eight minutes," Farrell said of the sweat. "With the lights and everything. He's a very strong player so once you get heads-up it was kind of like, 'Well, I hope I get ace-jack and he gets ace-nine!'" "It's impossible to separate them all," he said. "I'm going to be diplomatic and say they're all equal at the moment, but this one is freshest so I'm loving this one." Hand #106: Claas Segebrecht shoved all in for his last 2,475,000 with from the small blind. Benjamin Pollak called from the big blind, but didn't seem to love it as he shrugged and called with . Hand #100: Riess shoved all in with for 5,100,000 from the small blind and Pollak called with from the big blind. The board ran out and Riess was eliminated in fourth place. He will take home €230,071 for his finish. 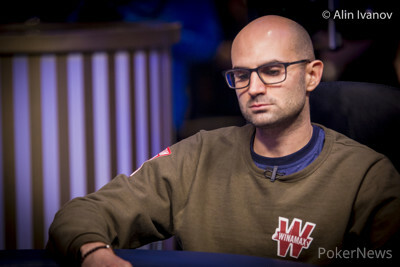 Pollak now leads the final three players. 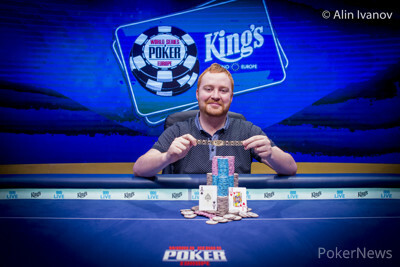 Hand #98: Niall Farrell shoved all in for 13,500,000 with and Claas Segebrecht folded in the big blind. Hand #99: Benjamin Pollak shoved under the gun with for 9,050,000. Ryan Riess called with . The board ran out and Pollak doubled up. Hand #93: Benjamin Pollak moved all in from the small blind with and Niall Farrell folded in the big blind. Hand #94: Farrell limped in the small blind with and Claas Segebrecht checked in the big blind with . The flop came and Farrell bet 900,000 and Segebrecht called. The turn was the and Farrell bet 2,000,000 and Segebrecht folded. Hand #95: Segebrecht raised to 2,300,000 in the small blind with and Ryan Riess folded in the big blind. Hand #96: Farrell raised with to 1,700,000 from under the gun and Pollak defended his big blind with . The flop and turn of were checked by both players and the river was the . Pollak bet 2,100,000 and Farrell folded. Hand #97: Riess moved all in with from the button for 12,850,000 and took down the pot. Hand #90: Niall Farrell limped the small blind with and Claas Segebrecht checked his option. The flop came and Farrell bet 700,000. Segebrecht called. The turn was the and Farrell checked and Segebrecht checked behind. The river was the and Farrell bet 2,000,000. Segebrecht called and Farrell won the hand. Hand #91: Segebrecht limped with and Ryan Riess checked his option with . The flop came and Segebrecht bet 600,000. Riess raised to 1,500,000 and Segebrecht called. The turn was the and Segebrecht checked. Riess checked behind and the river was the . Segebrecht bet 3,000,000 and Riess folded. The players then went on a 20-minute break. 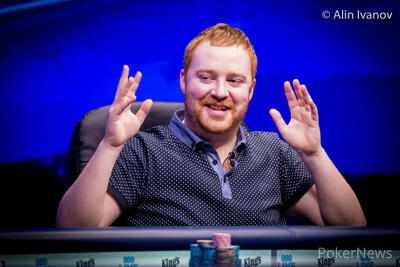 Hand #85: Niall Farrell received a walk with in the big blind. Hand #86: Benjamin Pollak moved all in from the button with and took down the blinds and antes. Hand #87: Farrell raised to 1,300,000 on the button with . Claas Segebrecht called in the small blind with . Segebrecht checked and Farrell bet 1,200,000. Segebrecht called. The turn was the . Again Segebrecht checked and this time Farrell checked behind. The river was the and Segebrecht bet 4,000,000. Farrell folded. Hand #88: Segebrecht raised to 1,200,000 from the button and took down the blinds and antes. Hand #89: Ryan Riess raised to 1,300,000 on the button with and Farrell defended his big blind with . The pair checked down a board of and Riess took down the pot. Hand #80: Ryan Riess limped with and Benjamin Pollak checked his option with . The flop came and Riess checked. Pollak bet 900,000 and Riess folded. Hand #81: Claas Segebrecht opened under the gun with to 1,200,000 and Niall Farrell defended the big blind with . The flop came and Farrell checked. Segebrecht bet 875,000 and Farrell folded. Hand #82: Farrell got all in against Segebrecht preflop and Farrell flopped a straight with against the of Segebrecht. The board ran out and Farrell doubled up. Hand #83: Segebrecht limped the small blind with and Riess checked his option with . The flop came and Segebrecht bet 600,000. Riess folded. Hand #84: Riess limped with and Pollak went all in for 16,125,000 with . Riess snap called. The board ran out and Riess doubled up. Hand #79: Claas Segebrecht raised to 1,200,000 from the button with . 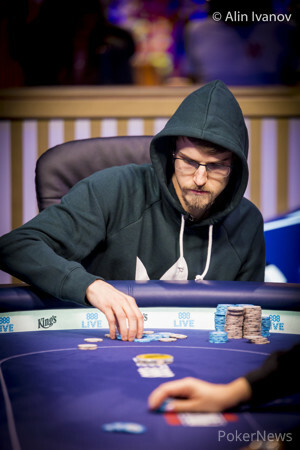 Sylvain Loosli three-bet all in for 4,125,000 from the small blind. Ryan Riess folded the big blind and Segebrecht called. The flop came with no help for Segebrecht, but that all changed on the turn which gave Segebrecht a set. The river was the and Loosli was eliminated. 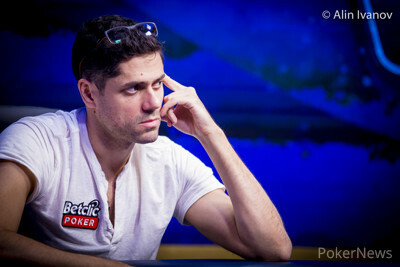 Hand #76: Benjamin Pollak opened with to 1,750,000 and everyone folded. Hand #77: Claas Segebrecht got a walk. 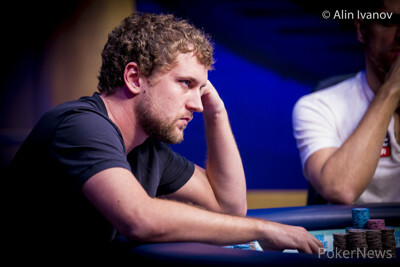 Hand #78: Ryan Riess raised to 1,400,000 with and everyone folded.